BEYOND DESIRE at MoMu museum Antwerpen. Desire, attitude and styling in African and Western cultures. BEYOND DESIRE, which is MoMu’s sixth important thematic exhibition, takes desire as its point of departure and examines the way in which two cultures, the African and the Western, influence one another and adopt each other’s visual idiom. 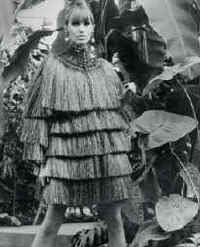 European fashion designers have adopted the embellishments, scarifications, colours and textiles of the Masai, and combined them with elements of Western haute couture. 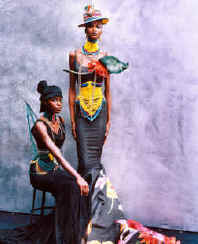 In addition to fashion, the exhibition includes fashion photography, African studio photography, art and documentaries. Momu has made a selection of work by the photographers Depara and Malick Sidibé, and is also exhibiting several pieces from the work of the contemporary studio photographer Apagya. Also the publicity campaign by Diesel (1991) "What if Africa were the ruling centre of the world", a quote by president and founder of Diesel Renzo Rosso, will be included in the exhibition. The last section of the exhibition is a shop designed by Xuly Bët. Related Harn Museum presents "Sense, Style, Presence: African Arts of Personal Adornment" on display through June 2006. Harn Museum of Art. For the last news about Momu. Beyond desire you should join our African Art Club and become an insider of the African art market.